In 2011 we decided to do a major refit on Ocelot. The major boat work we were looking at was: remove/replace teak decks, paint the topsides and cabin top, check/replace rigging, and varnish the interior. After 10 years on Ocelot (16 years old) and 40,000 nautical miles, it was time, and since Sue and her brother had just sold their parents house, we had the money needed. The SW monsoon was almost over, so we had no reason to head over to eastern Malaysia. The time was right. Thailand and Malaysia were close by and convenient. The Philippines were cheaper but further away. They also had no teak and got the occasional typhoon. The Caribbean was too far away, and other potential places were too expensive. 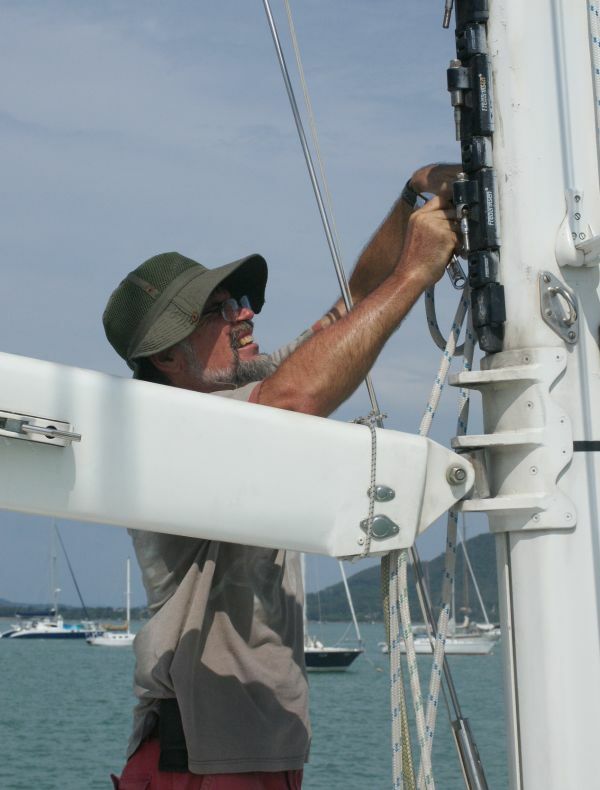 Malaysia had the advantage that equipment could be imported into Langkawi duty free, but Malaysia is affluent enough that few locals want to work on boats. Thailand charges import duty but they have a skilled and relatively inexpensive labor force, and most of our expenses would be labor. We also needed a boatyard to work in. Satun is just NE of Langkawi, but the yard there is far from everything and we didn't know any people there. There are more than 4 boatyards in Phuket that can take catamarans, and that's where most of the qualified workers are. Coconuts is the cheapest, but it's just a flat sandy spot. Au Po Marina and Boat Lagoon both have concrete boat stands, but they're 2‑3 times as expensive as Coconuts. Perhaps the most important criteria was who would do the work. Unfortunately, there's a language barrier, as neither of us speak any Thai beyond the pleasantries - greetings, thank you, etc. We decided that we needed an overseer, someone to manage the workers and take responsibility for the costs, quality, and timeliness of the work. Talking to other cruisers we had come up with the names of 3 well‑recommended project managers: Nai, Oh, and Boat Lagoon. A 4th name was recommended when we visited the Coconuts yard: Golf, who is the primary boat contractor there [ed: Golf is no longer welcome in Coconuts, or anywhere in Ao Chalong, because of unpaid debts]. We talked extensively to all 4. Boat Lagoon we knew would be the most expensive, and (somewhat to our relief) they completely blew us off. After promising to come look at Ocelot and talk to us, they never showed and never even apologized. Not very professional, in our opinion. We'd contacted both Nai and Oh several weeks earlier but by the time we actually got to Phuket, both were too busy to take on all the jobs we wanted done. They both sent alternate representatives, but we had no information on either of them and neither were completely responsive to our needs. Consequently we got partial quotes from them, with suggestions that we take the jobs they couldn't do to someone else. Golf, on the other hand, was very responsive. He visited Ocelot several times, his prices were good, and he claimed he could do everything we wanted done. He supplied 3 references when we asked and all 3 reported good quality work from him. Some jobs had run late, but Golf had stuck to his quoted prices. We checked out the quality of some of his jobs and they seemed good. But most telling, Golf did not seem to be satisfied with doing anything less than the best job he could. When we asked him to quote on repainting our cabin top in a good 2‑part polyurethane paint, he replied that what was really needed was to replace the gelcoat. When we pointed out that this would mean replacing our molded‑in anti‑skid, he replied that it would be no problem for him, as he could make us new anti‑skid. When we asked for samples, he brought several for us to choose from. The quality was good enough that we decided to rip off our (hot, heavy) teak decks and replace them with (cool, light) gelcoat anti‑skid. Now that the jobs are finished, we've broken them up into separate Project Areas. The top level links below go to individual pages for the 15 Project Areas we've defined, with discussions on each of the major jobs that happened in those areas. The individual links (which are repeated on the discussion pages) go to the start of that particular job. But since most jobs took more than 1 day, they are often continued on subsequent days. All floor supports epoxy coated. The table on the right shows Golf's quoted prices to us for the work to be performed by him. The actual costs for the work varied from this a bit and we hope to publish them when we get the time. However, it should be noted that Golf did not finish ANY of these jobs, and squandered about $30,000 of the money we gave him on himself, probably on drugs, women, and/or gambling. We fired Golf in November 2012 after paying him about $60,000 and it then took over a year to finish Ocelot, even with 6‑10 good workers. The Thai police claim to draw a distinction between a simple deadbeat who doesn't pay his bills, and someone who takes money but then doesn't perform the service contracted for. The police don't want to play debt collectors, so they consider deadbeats who don't pay their bills to be a civil matter and not within their jurisdiction. We clearly fall into category #2, and in theory the police will go after someone who doesn't perform on their contract, but in practice, when it's between a Thai and a foreigner, the police (and the entire Thai legal system) tends to turn a blind eye. While we have action pending against Golf, we seriously doubt we'll see any of our $30,000 back. And we don't believe he has any of it left anyway. In retrospect, we never thought the original quote would stand up for the whole job. Problems are always found when one goes looking for them, and the Thai workers were pretty good at finding problems. So there will always be add‑on jobs. Golf had submitted extra quotes for these add‑on jobs, and we'd accepted some of them. Some contractors figure they then have you by the short hairs once the boat is out of the water, so they can charge more for those extra jobs. Golf took it a step further. Since we had to get Ocelot back in the water, he did extra destruction jobs (like grinding all the gelcoat off the underwater surfaces) and just assumed that we'd continue paying until everything was put back together. Which we did. But he didn't realize that we'd fire him after he stole so much money from us.